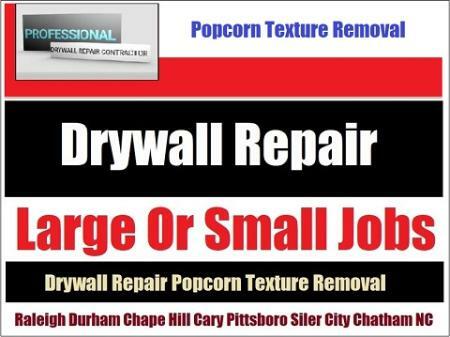 Drywall construction hanging, finishing and popcorn texture removal in Pittsboro? Call Drywall Specialist A skilled local expert with years of repair, installation, taping, bedding and mudding experience. Affordable prices and free estimates on large or small jobs in Pittsboro, NC. Pittsboro NC: 27207	Bear Creek. 27208	Bennett. 27213 Bonlee. 27228	Bynum. 27252	Goldston. 27256	Gulf. 27312	Pittsboro. 27344	Siler City. 27559	Moncure. Drywall Specialist Copyright 2019 All Rights Reserved 919-742-2030 Drywall Construction | Hanging Finishing Pittsboro North Carolina.